Over 200 hundred incidents cited for failure to comply with medical health and safety standards. 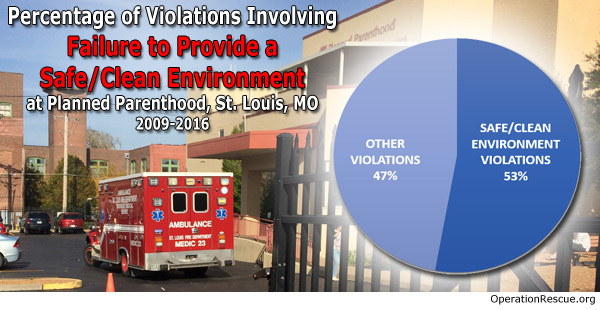 St. Louis, MO – Operation Rescue has obtained five Statement of Deficiency Reports that show Missouri state inspectors have cited the Planned Parenthood abortion facility in St. Louis, Missouri, for 39 classes of violations involving 210 incidents – 53% (111) of which were related to failure to provide a safe and sanitary environment. The reports were based on inspections that took place in 2009, 2013, 2015, and 2016. Of the 210 incidents upon which the citations were based, 61% were identified in 2016. The St. Louis Planned Parenthood is considered a high volume abortion facility. It is estimated that over 5,000 abortions take place there each year. The inspection reports indicated that on average 340-462 abortions were conducted at that facility each month. All patients were potentially impacted by the violations. “We have long understood that the St. Louis Planned Parenthood abortion facility was among the worst in America when it comes to abortion-related complications based on the large number of ambulance runs observed there. But now, reading over the inspection reports, we can see the truly horrific extent of dangerous health and safety conditions and practices that endanger women every day there,” said Newman. The 2009 inspection showed two citations based on six incidents. Two employees that assisted with surgical procedures showed no evidence of training for such duties. The facility also had failed to conduct an adequate number of fire drills between over a four-year period. •	Using single-dose medication vials for multiple patients. Single dose vials contain no preservatives and must be discarded after the needle has pierced the seal. •	Failure to remove expired inventory from active stock. This included items such as IV Solutions, various drugs such as Valium, ammonia inhalants, and other supplies used on patients. •	Failure to date multi-use vials of drugs, leaving no way to know when the drugs should have been discarded. •	Failure to replace worn, rusted, or deteriorating equipment, including suction machines, IV stands, stools, etc. Often the staff attempted to mitigate the rust problem by covering it with clear tape, but that only made things worse since tape cannot be disinfected. •	Ceiling fans in the three procedure rooms and storage room were full of visible dust. •	Plastic supply bins with patient supplies covered with dust and debris. •	Failure to conduct monthly inspections of portable fire extinguishers. •	Quality Assurance program failed to review all abortions that occurred at 18 weeks or later as required. •	Failure to provide patients with information about how to file complaints with state agencies. •	Failure to check job applicants with the Employment Disqualification List prior to hiring. In 2015, the incidents on which violations were based increased. Thirty-two out of 40 incidents were related to failing to provide a safe, clean environment. •	Failure to restrict multi-dose vials to a centralized medication area separate from patient treatment areas to avoid contamination. •	Failure to date medications and remove those that were expired. •	Failure to monitor humidity in the clean/dirty instrument processing areas, which can affect the integrity of the sterilization and storage processes. There was no humidistat anywhere in the facility. •	Failed to follow manufacturer’s instructions for cleaning and operating the autoclave, an instrument used to sterilize surgical instruments. In fact, no manufacturer’s instructions could be found in the facility, so one staff member finally printed the instructions from the Internet. •	Stored “sterile” instrument sets on unlined shelves near the floor, creating a risk of contamination. •	Two large tears in the pad on the ultrasound table that made it unable to be disinfected. One staff member told the inspector a new pad had been ordered when no order was ever placed. •	Expired supplies such as hand sanitizer and Tempa-Dot thermometers used in the medication refrigerator. •	Pillows in the procedure and ultrasound rooms were dirty and covered with torn vinyl or cloth pillow covers that could not be disinfected. •	Dust, dirt, and unsanitary tape residue found throughout the facility, including on the medication refrigerator, shelves, cabinets, storage bins and walls. •	Medication refrigerator had dirt, debris and hair in the bottom of the unit. One worker who had been employed at the facility for 1 ½ years said the refrigerator had never been cleaned during his term of employment. •	A wheelchair that was described as “often used” was covered with a layer of dust that left a mark when a finger was pulled through. •	Failure to submit a copy of the pathology reports for all aborted fetal tissue to the Missouri Department of Health and Senior Services as legally required. At no time in 2013, 2014, or 2015 did the Department of Health send inspectors back to Planned Parenthood to ensure that the deficiencies cited were actually corrected. That changed in 2016, after Planned Parenthood was cited for 16 categories of violations involving 127 incidents on March 16 of that year. Some violations were repeat offenses, such as the discovery of dust and dirt that posed contamination issues, failing to remove expired medications and supplies from inventory, and failing to replace worn or deteriorating patient care items. In one egregious example, Planned Parenthood was cited in both 2015 and 2016 for failing to follow the manufacturer’s instructions for cleaning the facility’s two autoclaves (sterilizers). The inside of the autoclaves was discolored with brown spots. Biological indicators that were supposed to be used with each load to ensure proper sterilization were only used weekly. Peel packs, in which surgical instruments were “sterilized” were folded over beyond the recommended line, compromising the sterilization process. The supply cabinets were full of such improperly sealed peal packs of instruments that were being used on patients. Planned Parenthood had also failed to halt the hazardous practice of keeping multi-use drug vials in the procedure rooms, which risks cross-contamination. •	Failure to properly record temperatures on the medication refrigerator, or recording temperatures outside the recommended ranges. Some medications were not supposed to be frozen, but freezing temperatures were recorded numerous times, without correction. •	Failure to provide infection control training to staff. •	Failure to have staff and volunteers sign an annual statement of HIPAA compliance. •	Failure to ensure that medication orders were timed, dated, and signed by the ordering practitioner. This failure occurred time after time in 11 of 13 patient files reviewed. Some charts lacked dosages of drugs that were administered. In the event of an emergency, a patient’s life can be endangered if emergency responders do not know when or how much of a particular drug has been administered. •	Failure for providers to sign date or time medical records. •	Failure to ensure that patients were fully reactive with stable vital signs before discharge. Charts showed vital signs were not taken every 15 minutes in recovery as required. Patients were discharged without a record of discharge vital signs or Aldrete scores (a medical scoring system used for measuring recovery after anesthesia). For the first time, inspectors returned to Planned Parenthood two months later to ensure the facility was in compliance. Once again, it was found that a new hire had not been checked with the Employment Disqualification list prior to hiring, nor was a criminal background check performed. It is easy to see why Planned Parenthood has actively opposed Missouri’s attempts to pass mandatory annual inspections for abortion facilities. Records obtained from the St. Louis Fire Department and eye-witness documentation show that 63 medical emergencies have occurred at the Planned Parenthood abortion facility during the same time frame as reflected in the inspection reports. In 2016 alone, when violations were at their peak, there were six incidents that required emergency ambulance transport to a hospital emergency room. Despite the dangers to women, certain aldermen are attempting to make St. Louis a “Sanctuary City for Reproductive Rights.” There is currently an attempt underway to amend the city charter to make pregnancy and “reproductive decisions” a protected class along with race. There are also future plans to pass a buffer zone ordinance restricting free speech rights around the Planned Parenthood facility. Those action will only serve to infringe on the First Amendment rights of pro-life activists and create greater unaccountability at an already dangerous abortion center. Last month, Planned Parenthood sued the State of Missouri claiming that abortion safety laws are unconstitutional. If a court agrees, it would open the door for the St. Louis Planned Parenthood organization to expand their unsafe abortion practices to Springfield and Joplin.